Islanders are being asked to take a moment to show your support for Prince Edward Island’s bid to host the 2023 Canada Winter Games. All you have to do is enter the 1st three digits of your postal code to show your support! No further information is required. Islanders are also invited to show their support by attending the 2023 Canada Games Support Rally from 11 AM – 1 PM on Thursday, September 20 at Founder’s Hall. 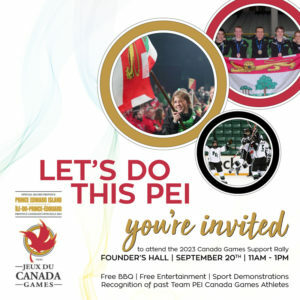 The rally will host a free BBQ, free entertainment, sports demonstrations, and recognition of past Team PEI Canada Games Athletes. All are welcome to attend!